When John heard in prison what the Messiah was doing, he sent word by his disciples 3 and said to him, “Are you the one who is to come, or are we to wait for another?” 4 Jesus answered them, “Go and tell John what you hear and see: 5 the blind receive their sight, the lame walk, the lepers are cleansed, the deaf hear, the dead are raised, and the poor have good news brought to them. 6 And blessed is anyone who takes no offense at me.” 7 As they went away, Jesus began to speak to the crowds about John: “What did you go out into the wilderness to look at? A reed shaken by the wind? 8 What then did you go out to see? Someone dressed in soft robes? Look, those who wear soft robes are in royal palaces. 9 What then did you go out to see? A prophet? Yes, I tell you, and more than a prophet. 10 This is the one about whom it is written, “See, I am sending my messenger ahead of you, who will prepare your way before you.’ 11 Truly I tell you, among those born of women no one has arisen greater than John the Baptist; yet the least in the kingdom of heaven is greater than he. One of my professional passions is in the area of those outside of the church. I’ve spent years of study, conversation, and trial-and-error in connecting with many of these people. I’ve recently been on a journey of discovery about our Millennials (that generation that is between 20 and 35 years of age), and why they by-and-large are uninterested in church—or, if present, see the church quite differently. First to those of you who are under 40. We haven’t listened to you very well. I don’t have easy answers, but do know that those of us who are older have to take your views more seriously than we have. The fact that an entire generation is largely missing from Christian congregations of all stripes means that what we are doing isn’t significant to you. And research indicates that once you leave you aren’t likely to come back, even if you have children (which worked for previous generations). I’m hearing you say that you find no compelling reason to be part of a congregational community. Everything you would get from a church that would be of value you can get at least as well somewhere else. No only do many of you as youth and young adults find the church not really helpful, but your view of the church and Christianity is more negative than positive. You often categorize the church as hypocritical, judgmental, exclusive, homophobic, and more into political power than loving our neighbors. Not every congregation falls into that generalization, and I think LCM does a little better than some. But unfortunately, we all get lumped together whether we like it or not. Few positives and lots of negatives. Makes for a grim outlook for the future of LCM and the rest of the church, doesn’t it? I don’t necessarily think so. I bring this up on the 3rd Sunday of Advent because I think John the Baptist can actually help us all understand some things. John the Baptist gets you, I think. He asks questions of Jesus that sound a lot like the questions you ask. John’s in prison in this text, having been arrested by King Herod for opening his mouth once too often. But regardless, from prison he hears about Jesus’ ministry and sends some of his own followers to question Jesus. Well, just one question. “Are you the Messiah, or should we keep looking?” Are you really going to make a difference, or just another religious hypocrite. Jesus’ answer: Tell John what you see. Blind see, lame walk, lepers healed, deaf hear, dead live, poor have good news. John is asking Jesus the same kinds of questions that many of you younger people are asking. Is the message of church significant for me? Are church people serious about God’s love and compassion? Do you really care? When we look at you, will we get a clear picture of this Jesus you talk about? And apparently, you’re not getting great answers to your questions. You look at the church as see the same judgmental, closed-minded, hypocritical people you see everywhere else. And the church therefore looks no different than any other volunteer organization. I hope you give us another chance. There are significant things that can happen through this church. There are some powerfully good things here. We are an organization that is built on love for all people, justice for all people, peace for all people, compassion for all people. The church has changed history, and in some pretty amazing ways. Hospitals, education, care for the poor, asylum for refugees, standing with those who are not part of the power structure—these are all things the church has a history of initiating. And we do so because of Jesus, actually. We may not follow him perfectly (and never will), but as long as we’re connecting to him we will feed the hungry, serve the poor, stand with the oppressed. We will follow Jesus in changing the world. You can’t judge the path based on those who are walking on it. To be the church in the world Jesus envisions, we need your help. Now to those of us who are older—40s on up. It’s not that people younger than you are opposed to God, but they are opposed to much of what they see being done in God’s name. They often see a church that talks badly about people. A church that claims their God loves everyone, but won’t stand up for the poor. A church whose God calls them to help those who are discriminated against, but isn’t putting much effort into it. A church that claims to follow Jesus in loving all people, even his enemies, yet seems to exist primarily for itself. What do you think people see when they look at LCM? A church that is willing to sacrifice for the sake of the world around us, or yet one more judgmental group of people. Though we are serious about God’s compassion and live that out every day, we can take more seriously how we reflect the Christ who forgives all. We send fifty-six 6th graders to Outdoor Lab, but we can acknowledge we don’t always emphasize living as disciples of Jesus. We can serve the neighborhood around us, but still need to listen to the critiques and repent when they are valid. As we struggle to love God, each other, and our neighbors, we can be honest about our struggle to love God, each other, and our neighbors. The future can be very good. We just need to be willing to be changed by two things: by God’s love for us shown to us in Jesus. And by the cries of people who need that love shown to them. In Advent, we as the church take time to ponder what God is about to do to make the world new. We get ready to join God in whatever that is. We know that God has already come into the world in the person of Jesus, and even as we prepare to celebrate his birth at Christmas, we also prepare to join whatever it is that God is getting ready to do now. We know that whatever God does it will definitely involve the things of God: love and grace and peace and compassion. It will also involve people revealing those aspects of God in the world as they commit to living in love and grace and peace and compassion. This is Advent—watching for God and preparing to join God in the world. John the Baptist is truly the prototypical Advent character. His whole message is exactly what Advent is all about. Get ready, he says. Watch, he cries out. God is doing something big, here, he says. You need to get on board with this. It’s major. This is the stuff that the prophet Isaiah talked about centuries ago, he tells people. It’s starting to happen now. We’ve always assumed that word means feeling sorry for your sins and promising never do them again. It kind of does include that, but it actually takes a little different turn than that—at least as John the Baptist uses the word. “Repent” is John’s big word, and he uses it in a bold and all-encompassing way. When John tells people to “repent,” he means more than feeling bad, but actually letting go of something in order to grab hold of something else. 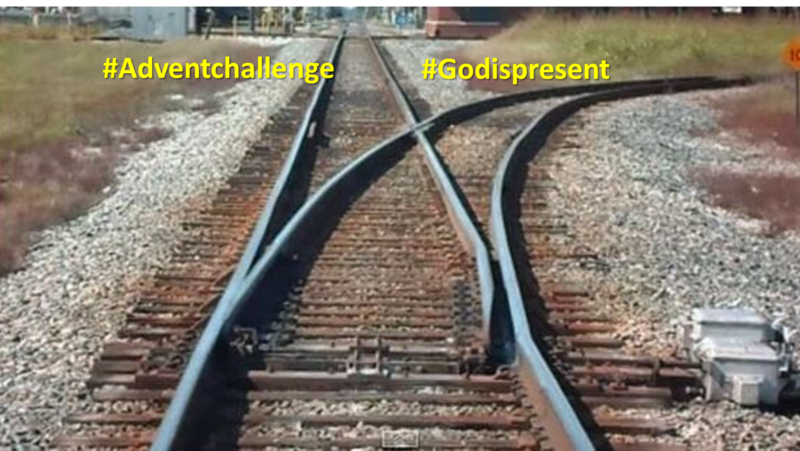 It’s a major change, To get off our track so we can get on God’s track. Since God is about to turn the world upside down, John tells us, and everything will be different. It’s imperative that we drop those things that have worked for us in the world and embrace what God is doing now. Do it now, for your own sakes, and for the sake of the world. If you aren’t clinging to God’s activity, you’re clinging to the wrong thing. Period. It’s that simple for John. To get off our track so we can get on God’s track. Repent, Pharisees. Let go of any notion that God owes you something because of your obedience to religious law. In God’s coming reign, everyone is loved equally regardless of their morality, their effort, or their own righteousness. Everyone will be treated with equal—and absolute—grace. Grab hold of this way that God is working. Make it part of your life. To get off our track so we can get on God’s track. Repent, Sadducees. Abandon the idea that you are righteous because of your parents or your ancestry or the faith in which you were raised. Just stop. Because God’s compassion will be shown to those with devout faith just as much as to those with weak. God’s will is for all people to live in peace, without fear. So judging others based on your standards means you’re traveling down a road to destruction. God’s love and grace are entering the world and are about to roll over you like a locomotive. And as of now, you’re on the wrong track. To get off our track so we can get on God’s track. The Advent message of John the Baptist still needs to be heard by us in our world. The character of God is often on a different track than the one we’re traveling on. We’re often looking to get ahead, while God is looking for others to catch up. We’re looking to prove ourselves right, while God is looking to prove that others are loved. We’re looking to protect ourselves from enemies with force if necessary, while God is looking to include those enemies in God’s reign. And John the Baptist’s cry to us is that we’ve got to abandon the track we’re on and switch over to the track on which God is traveling. Because these two different tracks go to two very different places. To get off our track so we can get on God’s track. It’s no longer enough to sit quietly in our church chairs on a Sunday and think that believing in God is all God wants of us. In the reign of God that John the Baptist calls out, love, care, compassion, grace, generosity aren’t quiet, and certainly not private. Advent calls us to let go of being irritated by xenophobia, and lovingly stand up for immigrants. Advent calls us to abandon the thought that taking advantage of the poor as distasteful, and graciously stand up for those who are economically challenged. Advent calls us to get off the track of being annoyed by homophobia or persecution of Muslims or sexism, and desperately cling to God’s track of actively loving our neighbors, in a way that they actually know it. That’s John’s call to repentance. To get off our track so we can get on God’s track. So here’s one small way I’m repenting this Advent. One way I’m changing tracks. Here’s what I’m planning to do to reveal God present in the world. Anything I post on social media, at least during Advent, will only reveal the things of God: love, compassion, inclusion, peace. I will be trying to abandon anything that isn’t revealing God and only recognize Jesus, the presence of God.